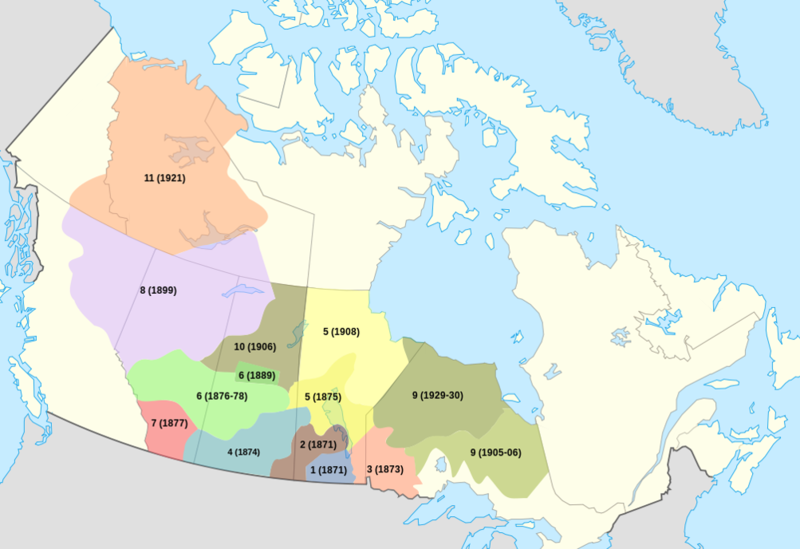 Prior to 1960, the treaties signed in Canada covered all of the country except for most of Yukon, British Columbia, and Nunavut. Historic treaties are those treaties signed by First Nations and the British and Canadian governments between 1701 and 1923. The British and Canadian governments wanted to sign treaties with First Nations in order to reduce the possibility of conflict and to support European immigration and land settlement, agriculture, natural resource use, trade, and other economic developments. The Peace and Friendship Treaties, signed in the Maritimes in pre-Confederation Canada, were intended to end hostilities and encourage co-operation between the British and Mi’kmaq and Maliseet First Nations. Unlike later treaties signed in other parts of Canada, the Peace and Friendship Treaties did not involve First Nations surrendering rights to the lands and the resources they had traditionally used and occupied. In modern times, the Supreme Court of Canada has confirmed that Mi’kmaq and Maliseet First Nations continue to enjoy their treaty rights to hunt, fish, and gather. James Douglas was the Chief Factor of the Hudson’s Bay Company in 1849, when its western headquarters was moved from Vancouver, Washington, to Victoria in the new British colony of Vancouver Island. Douglas became governor of the colony and began to encourage British settlement on First Nations lands. Over a period of four years, he made a series of 14 land purchases, known today as the Douglas Treaties. These treaties applied to territories on Vancouver Island and covered small tracts of land around Victoria, Nanaimo, and Port Hardy. Eleven Numbered Treaties were signed by the First Nations in Canada and the reigning monarchs of Canada (Victoria, Edward VII, or George V) between 1871 and 1921. The treaties provided the government with large tracts of land in exchange for promises made to the First Nations of the area. The specific terms differed with each treaty. The First Nations leadership and the Canadian government had different goals in signing the Numbered Treaties. Many modern treaties are being negotiated today. The Government of Canada officially calls modern treaties Comprehensive Land Claims. As of May 2017, 65 First Nations in British Columbia were participating in the treaty process. Six First Nations have completed a treaty. These negotiations are “tri-partite,” meaning that three levels of government are involved: the First Nation, the Government of Canada, and the Province of British Columbia. The first modern treaty in British Columbia was completed in 1999 with the Nisga’a First Nation although this treaty was negotiated outside of the B.C. treaty process. There are many barriers to First Nations achieving a treaty today. Some First Nations have been working for decades to get treaties for their people. The process is very slow and expensive. Also, for many years the Government of Canada tried to stop First Nations from organizing a treaty process. From 1927 to 1951, the Indian Act made it illegal to meet or raise funds for Indigenous rights and lands claims issues. The Government of Canada gets recognition of its sovereignty, but First Nations do not. First Nations get limited recognition of their right to a piece of land that is always much smaller than their traditional territory. They have to co-manage that land with the government. First Nations may achieve self-government, but they have to obey Canadian and provincial laws. Canada does not have to obey any First Nations laws. Modern treaties are the “full and final settlement” between First Nations and the federal and provincial governments. The First Nation agrees it will not make any legal claims against Canada or B.C. to right historical wrongs. For example, it will not seek compensation for any past extraction of resources or destroyed habitat. Fig 2.4: Number Treaties Map by Yug has been modified (Numbers added) and is used under a CC BY-SA 2.5 Canada Licence. Types of Treaties by Kory Wilson is licensed under a Creative Commons Attribution-NonCommercial 4.0 International License, except where otherwise noted.